It’s ridiculous writing about weight loss when the world is going crazy. As I write this, that Oompa Loompa in the White House imposed a travel ban preventing refugees from entering the very country whose rallying cry is “Give me your tired, your poor, your huddled masses yearning to breathe free,” and my country mourns as six Muslims were shot and killed in a Quebec mosque. Disturbing news like this would have led me to the fridge, now it gets me to my knees. Food, or any other addictive substance, may numb us for a short time, but once the effects wear off, the problem is still there, and we are worse for wear. It was a year ago this very weekend that I numbed myself stupid for the last time. I got some news I didn’t know how to process, so I did what I always did when I felt discomfort rise up within me – I rammed it back down with fists full of food. When I came to, my problem was still there, and I was sporting seven extra pounds as a souvenir – pretty impressive for two-and-a-half day bender! So, what got me to change a lifelong pattern of self-destructive coping? Prayer and action. I couldn’t change my situation, but I could change me, so I joined a fellowship of food addicts in recovery, and TOGETHER we support each other through life’s ups and downs. 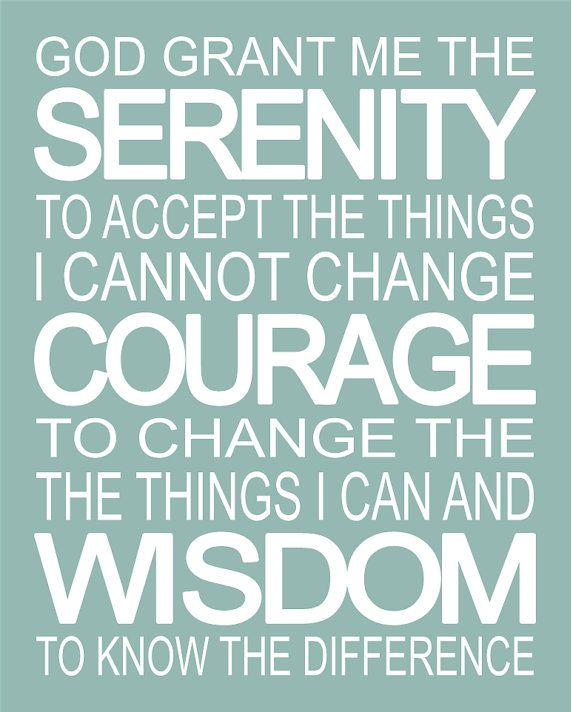 Instead of looking for a solution at the bottom of a Nutella jar when a problem arises, I say The Serenity Prayer and decipher which course of action to take. For example, I can’t change that buffoon south of the border, but I can do my part in preventing the spread of his moral and ethical herpes by vaccinating my mind, body, and spirit, with the antidote: LOVE. The day after Trump announced the bans, I signed up to volunteer my time assembling medical kits for doctors who go on missions around the world – the thought that this medicine will get to the very souls that Trump is trying to keep out lights me up more than any of my binge foods ever could! Yes, what the world needs now is love, sweet love! I suggest we counter every act of destruction, hate, and discrimination with constructive, healing acts of service and love. We addicts can only do that if we put down our forks, bottles, syringes, joints, etc., and take action in making the world a better place.